The traditional recovery lunch after Derby Day had come around once again. The only thing not creased today for lunch are my clothes. I’m the last to make it to lunch out of our party of six. I’m not the only one hurting though! Why do we do this to ourselves every year? Because while it is a tough gig to get up, get dressed, and get to lunch, after the first beer we are excited about the meal to come. Why wallow in bed all day? There were dramas aplenty with this year’s lunch. We wanted to try Albert St Food & Wine as a group but it is renovating, so we booked at Stokehouse. Only issue is they didn’t let us know they decided to close on Sunday this particular year. Simon organised The Town Mouse the evening prior and we were lucky to get a group of six in. Having settled in, and reviewing the menu, we decided to put ourselves in the hands of the chefs and chose the tasting menu with some specific requests for the lamb dish, pork hock dish, and the cabbage which is a specialty here. As with all recovery lunches my recollection is patchy. What I will say is that there were a few dishes that hit the heights I had expected, a few that were good, and a few that were okay. The atmosphere here is casual and the previous occupants in Embrasse and 312 would not recognise the interior. One nice adaption in the new fitout is full and proper use being made of the front windows. There is nothing hidden, and that translates to the forwardness of the star ingredients in many of the dishes. The best dishes in my opinion were the desserts, along with the whole flathead which was amazing. 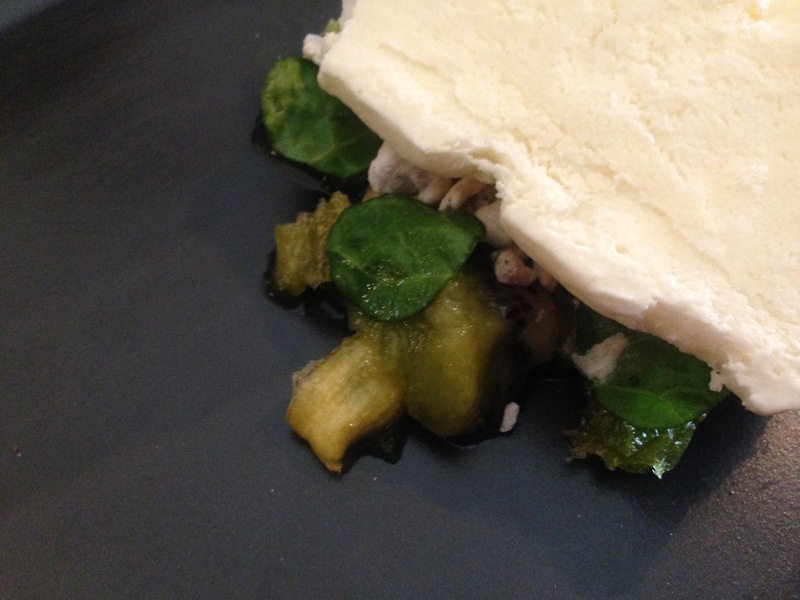 The yoghurt parfait combined clever flavours and textures, with balanced sweetness. 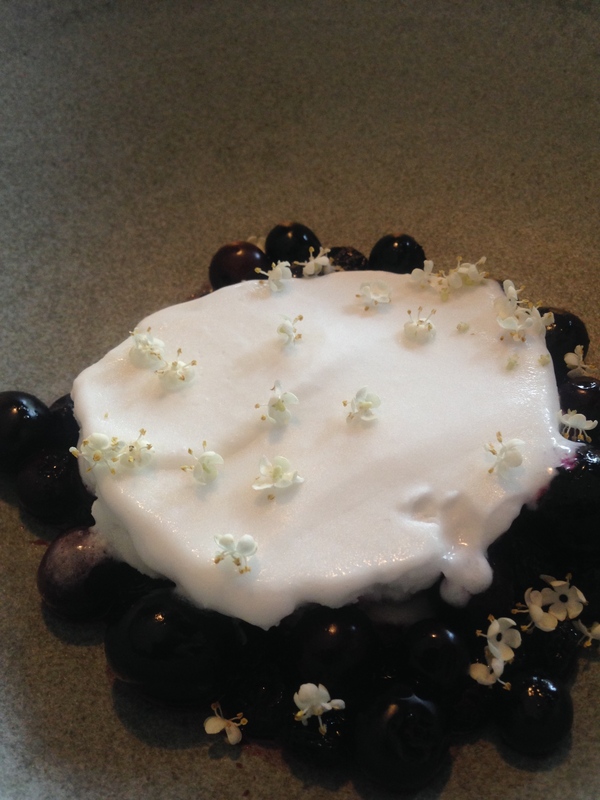 The blueberries with coconut sorbet was presented in spectacular fashion and was as good as it looked. 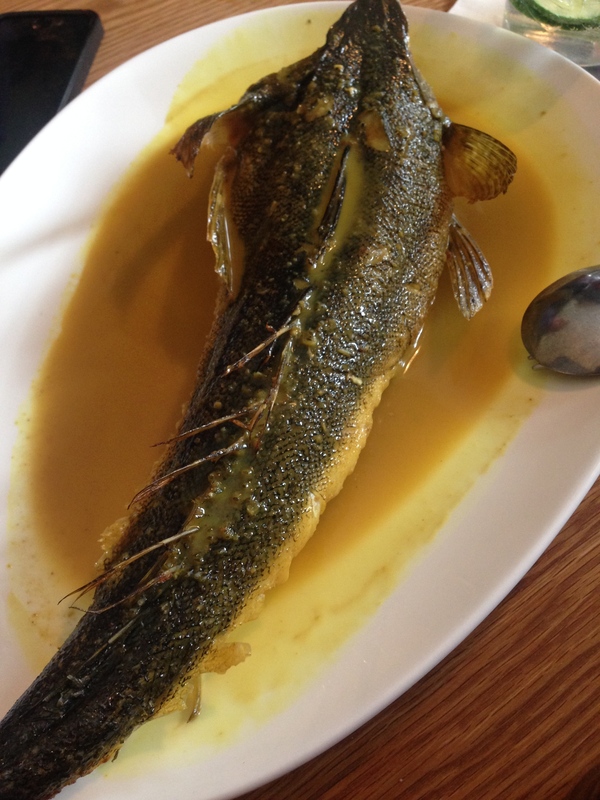 The whole flathead is novel in its presentation as a whole fish, incredibly well cooked, and completely delicious in the curry sauce. 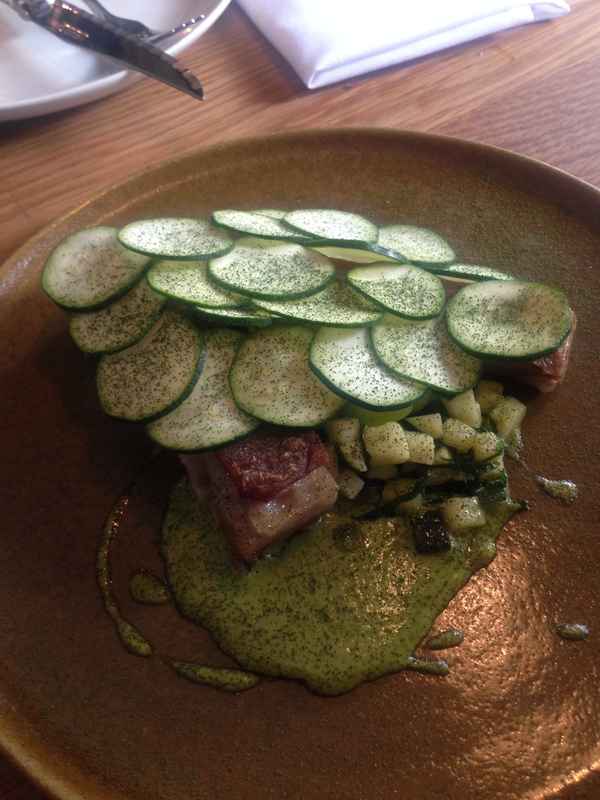 I thought the pork hock and the lamb dishes were good, as was the whole cabbage. Some of the guys had the trout down as one of their favourites but it didn’t hit the same mark for me. 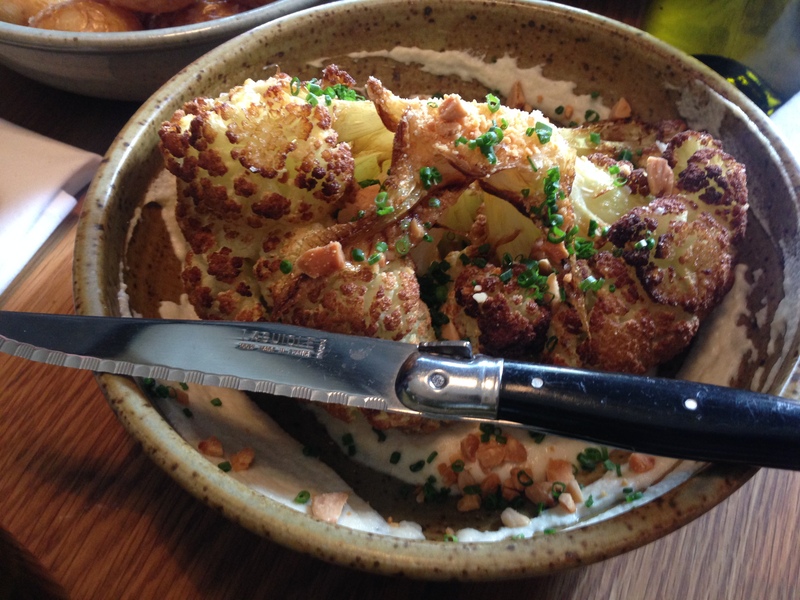 Of the remaining dishes I thought the roast cauliflower was a good side dish. It was a great afternoon at The Town Mouse. Professional and friendly service allowed our group to catch up in good spirit, and enjoy a lot of quality dishes, not to mention a few bottles from a complete and reasonable wine list. That reasonableness, and the prior evening are the main contributors to my lack of detail a few weeks on! Darling is nicely named for the area, especially since it is on the street its name is derived from. Walking towards the cafe from Toorak Road you can only really see the name written in white, on black boarding, with lots of glass. Once inside you are in a room resembling the latest design used in “The Block” with a mix of Scandinavian and industrial. The sunny, but mild, late Spring weather has rubbed off on the floorstaff and patrons alike. I noticed immediately that there is a bit of a focus on coffee when ordering my long black. I was offered to try one of the two single origins available, one an Ethiopian with acidic notes and a more robust Brazilian. I started off with the Ethiopian and finished with the Brazilian which I marginally preferred, but both were excellent. The touch of providing it half full and bringing a jug of hot water is great. Looking at the menu it becomes evident that there is a South-East Asian leaning to some of the dishes, with a specific wok list for lunch. Given this leaning I decided I’d try something a bit different, rather than the Darling big breakfast, which was enticing. 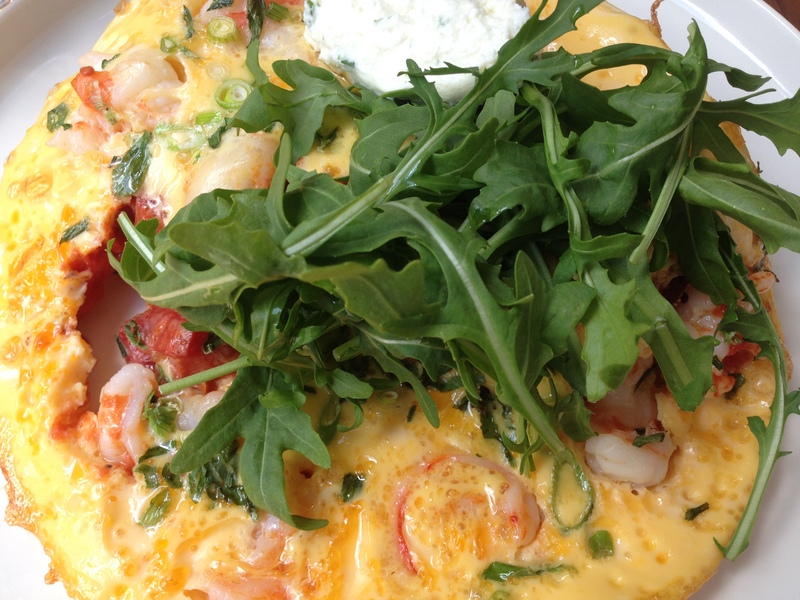 The mild chilli prawn omelette comes with piperade (a combination of tomato, onion and peppers), goats cheese, spring onions, and rocket, on a couple slices of very nice seeded bread. While it needed a good couple of sprinkles of the sea salt offered, the flavours all combined well, the prawns were fresh and generous, and the omelette itself was perfectly cooked. 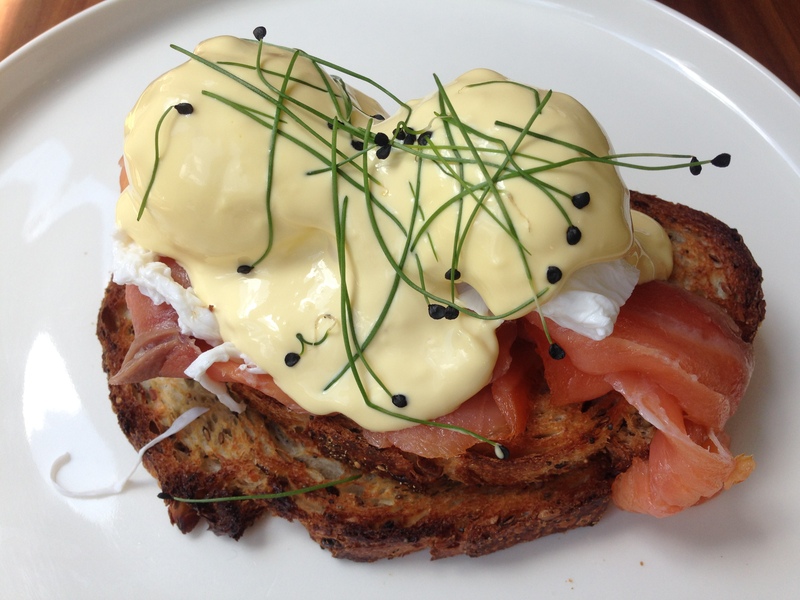 Catherine had the eggs benedict with smoked salmon in place of ham which is offered for only a couple dollars more. Again, the serving was very generous, especially the amount of salmon, which was delicious with the hollandaise, seeded toast, and poached eggs. The iced tea she ordered was great too with only mild sweetness, and some body, perhaps from a touch of condensed milk. We had walked to breakfast, and we certainly had to walk back considering the serving sizes! This was a pleasant breakfast and if that quality translates through to lunch it is also worth a visit for one of the dishes from the wok, not to mention another single origin from Brazil. There is no doubt that driving through Toorak is an experience with some of the most beautiful and luxurious homes in Australia. Naturally the people who live in those homes are very well off. The question is once they step out of their home where do they have to go for sustenance? There is a template for how cafes in this pocket of Melbourne need to look if they are to find a regular clientele to survive. Nestled in Hawksburn village, Town House does not go outside of that template. It is on the work rotation for lunch, but plays a mostly supporting role. We are never 100% sure how we decide to come but the fact it is a regular haunt is a good sign. Rarely do we go on a Friday so today I decide on the most Fridayish option and order the burger which is today using lamb. 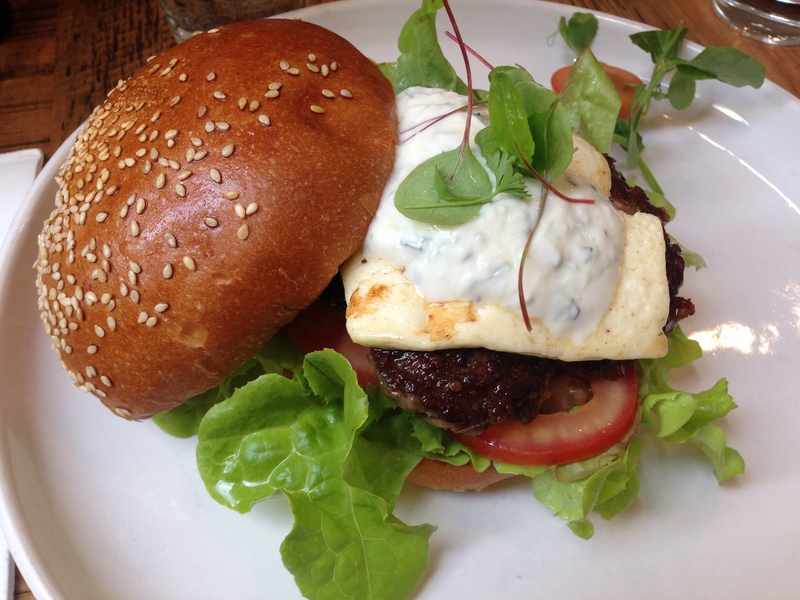 While pricey, it is a good burger with smart accompaniments for the lamb in the yoghurt sauce, and Halloumi cheese. I have a big night ahead so I put aside the beer order for coffee. 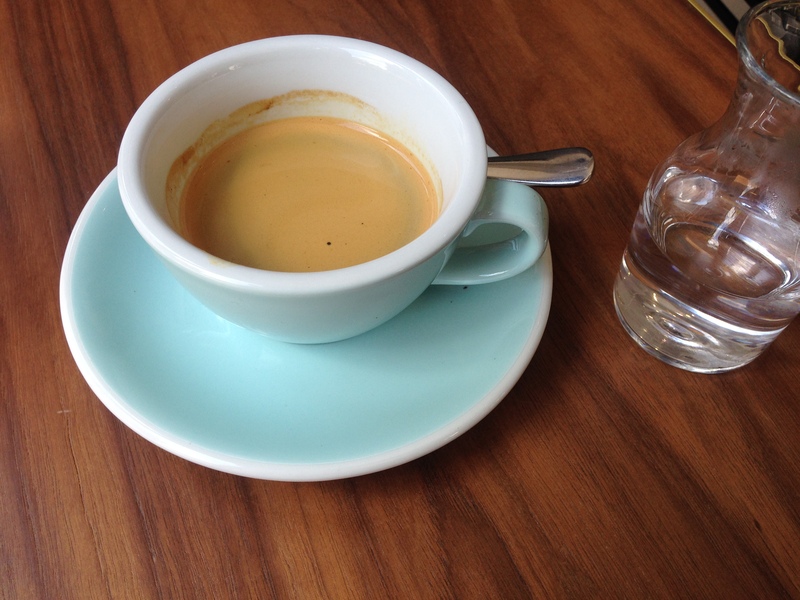 The baristas’ at Town House do a good job with consistently good quality coffee being served. Similarly the waitstaff do a good job and given the area this is a no hipster zone. Town House is a solid café that is worth checking out if you are in the vicinity. Take the back streets on the way there or back and enjoy the architecture. One sure fire way of making an immediate impact is to have a clever, and most of all good looking, fit out. This is one thing that even the most nonchalant diner can see straight away. A good looking venue provides immediate attraction but is only a small piece of the puzzle. There is obviously a lot more to it, but this is one ingredient that should be easy to do, yet is often not well executed. At Denis the Menace in Cremorne, the airy and open warehouse ticks the first box. This is your traditional café, but with a Thai accent. The menu is filled with all-day breakfast options and has an extensive lunch menu too. We have no trouble finding something enticing. It was a very busy Friday lunch period and we were lucky to secure one of the last tables, but there is decent turnover. You can tell that with the busy lunch rush the waitstaff are under pressure. That pressure did lead to some mistakes being made, including Catherine’s glass of wine being missed. Once we realised it was not coming, and asked, we got a speedy rectification, and an apology which makes all the difference. While waiting for our drinks, I ordered the chicken burger which comes in a light bun with pickled vegetables. Catherine ordered the pulled pork roll which comes in a nice soft long bun, topped with plenty of chipotle mayo. 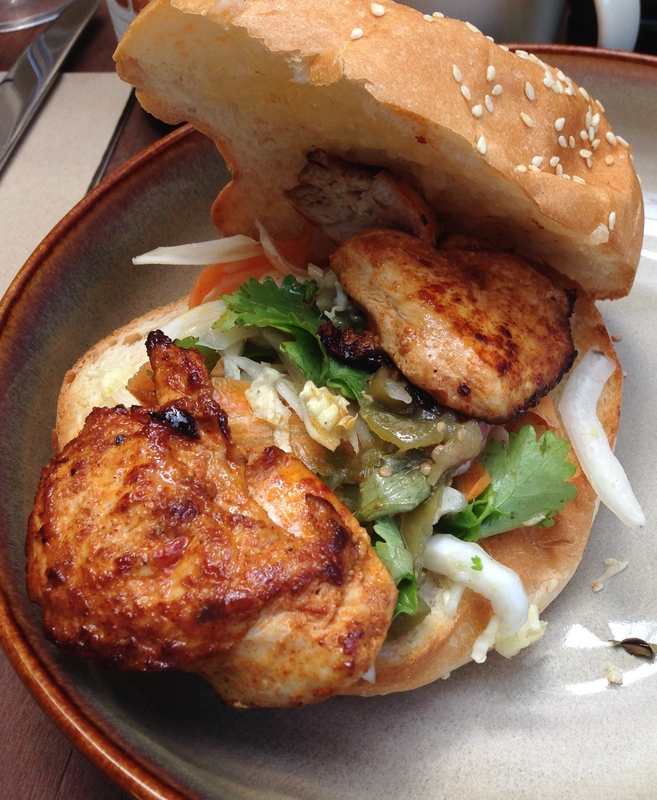 The chicken burger was fantastic, flavoursome with the right amount of spiciness, all ingredients working well together. Equally good was the pulled pork in a soft roll, although Catherine will ask for a touch less chipotle mayo next time around. And there will be a next time. There is a huge amount of potential here. Denis the Menace is still settling down having opened five months ago in an area that is more of an office worker hotspot, than a foodie haven. 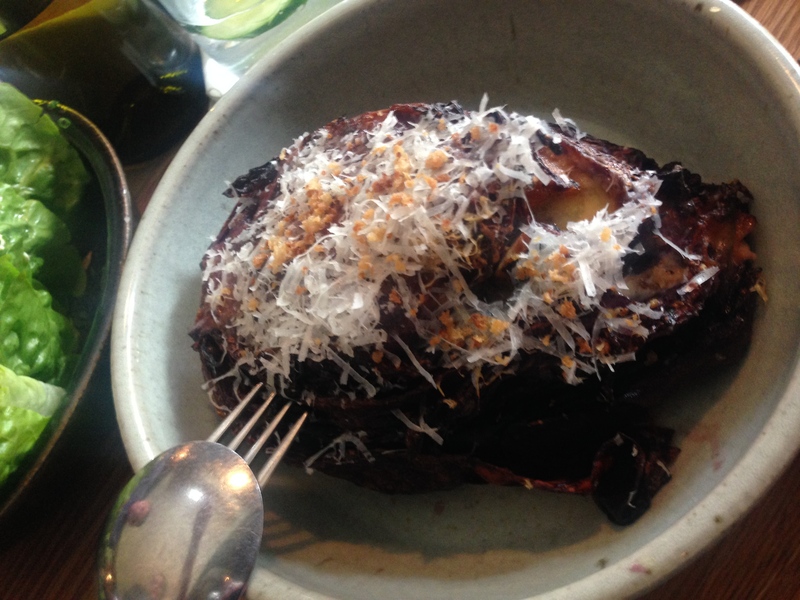 The food is smart, reasonably priced, and packed full of flavour. Success seems to be assured as long as Denis doesn’t go off the rails like its name sake! Hunky Dory is a boutique chain of fish and chip shops that are consistently packed with a broad clientele. The Richmond branch is still relatively new, but is certainly well established. On previous occasions we’ve taken away. Though given the comfortable dining space, both inside and out, there has always been a temptation to enjoy a meal here to get that added freshness that you miss out on with takeaway. Hunky Dory’s approach seems simple. Provide a reasonably priced (not necessarily cheap) quality product, in a sleek and comfortable space, delivered by friendly staff. They are competing with several like ventures along Swan Street like Meatmother, Jimmy Grants, Meatball and Fonda, so the fact all the tables are taken is a sign that the approach is working. Tonight we both order the fried blue grenadier, with a small chips to share (as suggested by the helpful counter staff), and a Greek salad. Fried fish is not rocket science but is easy to completely mess up! 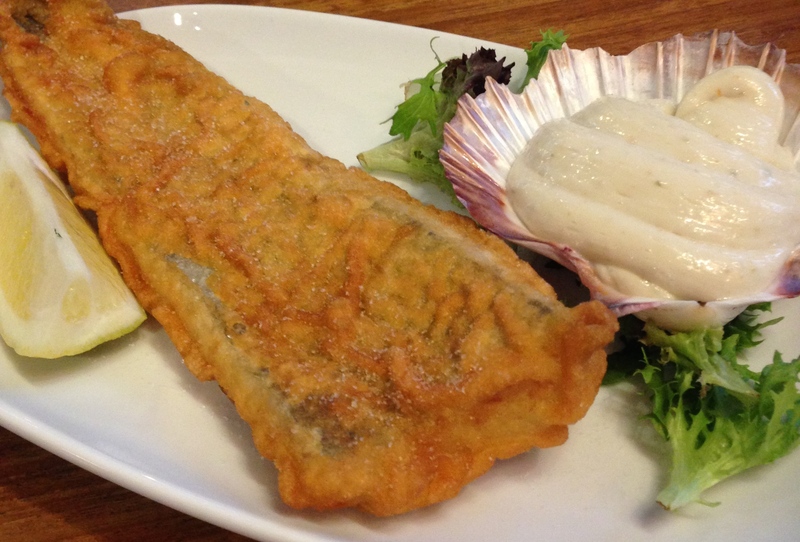 The blue grenadier is a white fish that is quite thin meaning overcooking is easy to do, but our fish is cooked well. 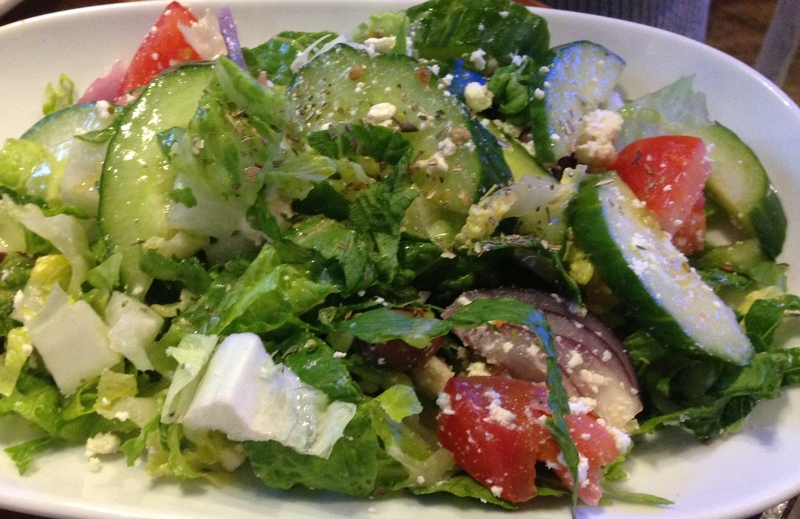 The chips are great and the Greek salad is lively and fresh. I’m looking forward to more visits to Hunky Dory for quality fish and chips on long summer nights, that are gladly just around the corner! Strange things are happening on Swan Street and the latest instalment may be the best named restaurant in 2015. What was an ugly duckling from both a visual and culinary perspective is turning itself around 180 degrees to become the hottest street in Melbourne, possibly Australia. Even a couple of years ago, a concept like Ugly Duckling would have little chance of surviving. Here we have a beautifully renovated rectangular room that is reminiscent of Long Island luxury, made for having a snack and /or a drink or two. It is not a bar in the traditional sense for Australia, especially for Richmond which is dominated by pubs made for pre/during/post matches in Melbourne Park. It is pre or post dinner, way home from work, casual in every way, except for the crowd which is flocking in huge numbers. Tonight it takes us a good fifteen minutes to be seated. The wine by the glass list is interesting and lengthy as you would expect given the focus, and there are plenty of other options for all tastes, including cocktails. 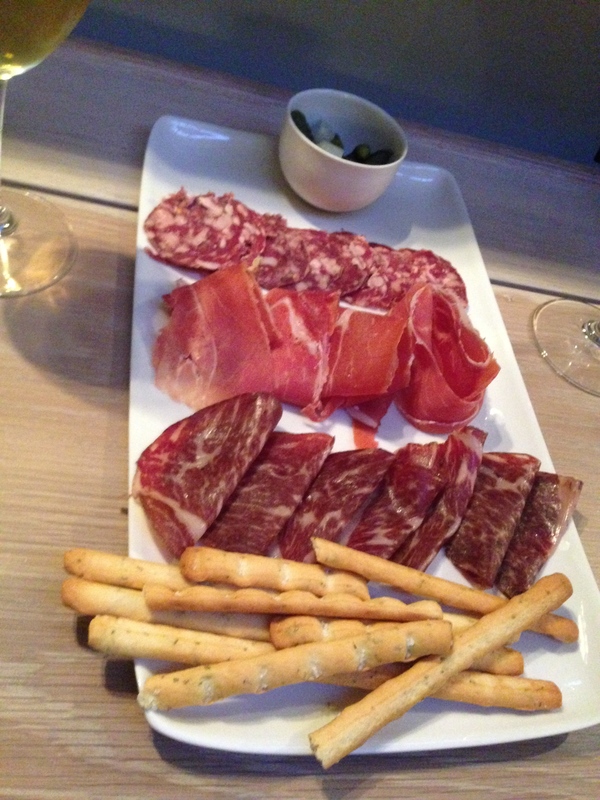 The ‘small’ salumi plate is surprisingly generous and reasonably priced, presented in attractive fashion, and providing a terrific accompaniment to the wine. Dramatic changes in a short space of time make Swan Street one of the most exciting strips to visit this year and perhaps Ugly Duckling signals the most dramatic of those changes. Something that will never go out of fashion is burgers and burger joints. It has been said of many things; but even the worst burger is still good. These days, there is not enough time for average burgers, meaning any visit needs to be planned and coordinated effectively. This means our net is not cast wide often. 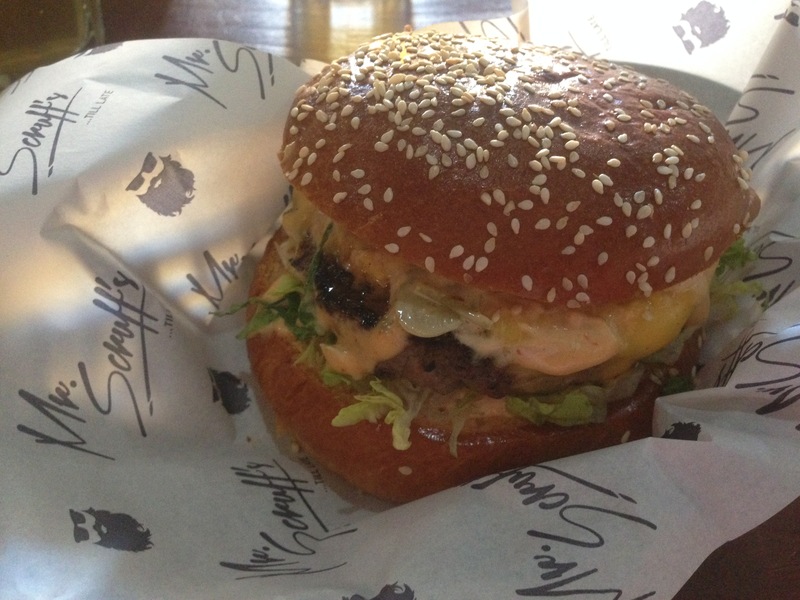 Today we’ve taken a chance on Mr Scruff’s on Smith Street in Collingwood. While it looks small from the front, walking through you quickly realise there is another room, plus a medium sized area downstairs out the back. In fact, given it is lunch, this place is jumping! Downstairs there are more enjoying a drink in the sun, than digging into the burgers on offer. Inside, the disco ball and extensive DJ setup is getting a rest, and burgers are the go. Both of us order the simple Beef Burger with American cheese, cos, pickles, onions, and Mr Scruff’s special sauce. Going back to the bar for another beer I hear the barperson proudly tell a customer that Mr Scruff’s has one of Melbourne’s best burgers. She also then tells me that on Friday and Saturday nights the disco ball is in full swing to the very early hours. It is always a difficult task to rank burger joints, especially on one sitting. What is clear to me is that Mr Scruff’s do a great burger and one that is not outshone by Huxtaburger further down the road which is one of my favourites.